Expert opinion on all things Dock & Door. Is your Dock Ready for Fall and Winter? Fall is now upon us, which means those cold winter months are sure to follow! Dock seals are designed to create a tight "gasket" around the back of the trailer when the trailer is positioned at the loading dock. Torn and deteriorated dock seals can allow quick loss of heated building energy. Additionally, these gaps can also allow moisture entry creating a possible safety concern for workers when transitioning into the backs of trailers. Is your loading dock ready to combat cold weather and moisture from entering the loading area? Contact us for a complete dock assessment and get your docks ready for winter! Check out the before and after shots of this dock seal replacement. Additional loading dock positions is just what this retail manufacturer needed! They looked to Rice Equipment for supplying the dock levelers and dock shelters for their project. Project scope included creating door openings and dock leveler pits along an existing exterior wall. Personnel safety at the loading dock should be paramount! Specifically, the ability to hold or restrain a trailer at the dock while loading/unloading occurs can be the difference between a proper and safe procedure and catastrophe! This client recognized their existing dock restraint was not up to operating standards and chose to replace it with the APS2000 dock restraint system. A positive engagement to a backing trailer could now be achieved along with clear communication to both the dock attendant and truck driver via interior/exterior LED signal lights. Have Rice Equipment schedule a site visit with you today, for a complete safety assessment of your loading dock! Concrete Work, We Got That! Dock edge failure created an unsafe scenario for unloading inbound materials for this customer. Complete replacement of the failed embedded steel channel, new channel and concrete, and a new Edge-of-Dock leveler were required. Upon completing the first dock position, the second dock position was also repaired and upgraded as well. All work performed in-house by a certified Rice Equipment technician! How Do You Handle Air Movement? How do you handle air movement in your facility? 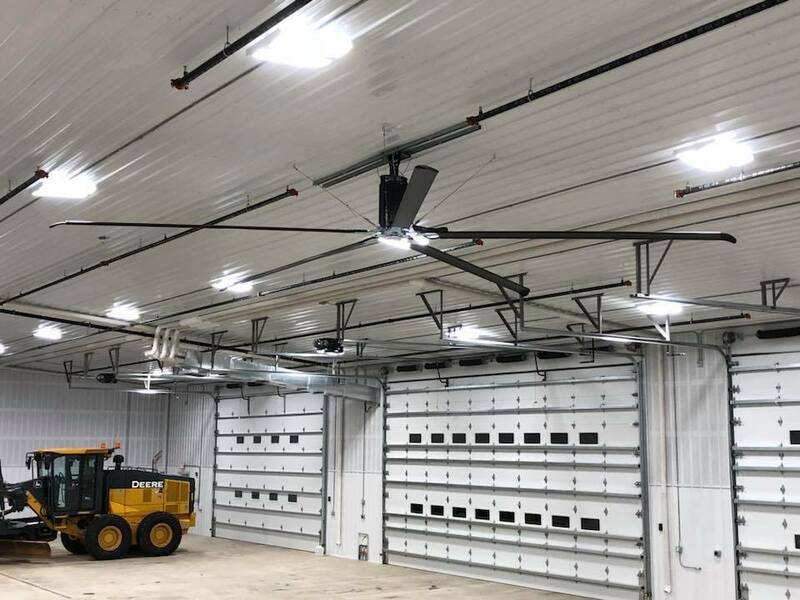 A High-Velocity Low-Speed (HVLS) fan is designed to provide big air movement for cooling effect during warmer months, while also de-stratifying and saving energy during the winter season. A local township opted for a large 24’ diameter fan in one of their highway commission buildings. Contact Rice Equipment when considering HVLS fans for your facility. Plans to expand this commercial printing companies facility included additional loading dock locations to handle the added logistics of inbound raw material and outbound finished product. They relied on Rice Equipment to assist with proper equipment sizing considerations for their specific needs as well as complete installation services. We have the solution to your need! "We need to service semi-trailers, but we don't have a loading dock." Serco LoadWarrior is easily customized to fit your exact application. This large 8'x8' platform allows the user to comfortably make a 90-degree turn with a pallet jack. Our dock lifts provide service from grade-level to 60" above grade, enabling the user to load across a perfectly smooth, level surface. What are the benefits of dock equipment? Every year numerous individuals are severely injured while working in proximity to the loading dock, several of which have been fatal. As the St. Louis economy shows signs of growth in the warehouse/distribution sectors, safety appears to be in decline. One of the best ways to combat injury at your loading dock is to use a 'trailer restraint.' Restraints grab onto the rear bar of a semi-trailer, preventing a driver from pulling away during loading/unloading. The Bellville News-Democrat reports, "Police were called to the scene at 1:24 a.m., and [the victim] was pronounced dead at 2:08 a .m. The [deceased] was loading appliances onto a truck. The truck driver thought the loading of his truck had been completed and started to pull away, which caused the forklift to fall backward, causing Boland to strike his head on the lip of the dock leveler, the coroner’s office said. Boland, 19, had worked at the facility for less than a month." Its fairly common to see individuals attempting to bypass safety policies, which further demonstrates the need for a trailer restraint system. "The lawsuit contends that the area where Zachery Boland worked should have had a vehicle restraint system or wheel restraint system." Hot summers are typical experience in the St. Louis area, and this year has further solidified this position. The heat index during late June through Mid-August has consistently peaked over 100 degrees on a daily basis. Excessive heat is a huge concern for warehouse employees who are performing demanding physical tasks in unconditioned logistics facilities. Unloading overseas cargo containers by hand is especially grueling during the summer. These dark colored shipping containers have a full-metal construction, and can reach oven-like temperatures. That's where our TURBO-ES Fan comes in. This fan unit, pictured below, produces a jet-like column of air - capable of reaching all the way to the back of a 53' trailer. This isn't the kind of fan you want blowing directly into your face. Rather, this fan is pointed along the side of the trailer, alleviating all of the hot, stagnant, and unpleasant air. For this customer, in Earth City, Missouri, the response was fantastic; relief was long overdue. This TURBO-ES Fan is accompanied by a Food/Pharma rated LED light, which comes with a 5-year warranty. The dual-purpose swingarm requires a smaller footprint on the facility's wall and increases electrical efficiency through advanced engineering design. How much does a dock leveler cost? There are numerous considerations when pricing a dock leveler. Budget $7,500 for a leveler from a reputable manufacturer. Cheap levelers come at a HIGH cost to your facility. What does a dock leveler do? Because not all loading docks and trailers are the same height, we must bridge the gap between the building and truck in a way that allows for the safe & efficient loading of trailers. In general, a longer leveler will provide greater service range, allowing you to service very tall or short trailers. What is the standard loading dock height? Some facilities may choose a different dock height based upon unique trailer configurations. An incline or decline approach can affect the the dock height. How do you calculate dock leveler capacity? Example: 12,000lb forklift + 3,500lb load x 2.55 = 39,525. Round up to 40,000. There are many factors that influence leveler capacity. How much does a dock leveler weigh? Greater capacity translates into thicker steel, meant to accommodate heavier loads. Loading docks are a hub of activity in warehouses and distribution centers. In most companies, this is the primary location of movement of product coming into and moving out of a facility. A loading dock is a recessed bay in a facility where trucks are loaded and unloaded. They are commonly found at manufacturing plants, warehouses and other industrial buildings. Loading docks may be exterior, flush with the building envelope or fully enclosed. Part of a facility's service or utility infrastructure, loading docks typically provide direct access to staging areas, storage rooms and freight elevators. When looking at the different operations taking place in a warehouse, distribution center or other unloading operation, loading dock environments can be one of the more hazardous areas. The OSHA regulation specific to loading dock safety is found in OSHA 29 CFR 1910.176 material handling. The majority of all regulations for the loading dock environment are actually directed to the operation and design of forklifts used on loading docks. Forklift safety regulations are referenced in the general industry standard, 29 CFR 1910.178 and construction standard 29 CFR 1926.600; 1926.602 and Part II, ANSI B56.1-1969 "American National Standard for Powered Industrial Trucks". To ensure a safe loading dock environment, safe operation of forklifts must be maintained. Forklift operators are required to be trained as operators to help in this effort. See Quick Tips #106: Forklift Operator Training for those requirements. OSHA regulations for machine guarding found in OSHA 29 CFR 1910.211 should also be applied. Other standards that can apply to loading dock safety are slips, trips and falls, which can be found in OSHA 29 CFR 1910.22 walking-working surfaces and the ANSI A1264.2-2006 provision for the slip resistance on walking/working surfaces. 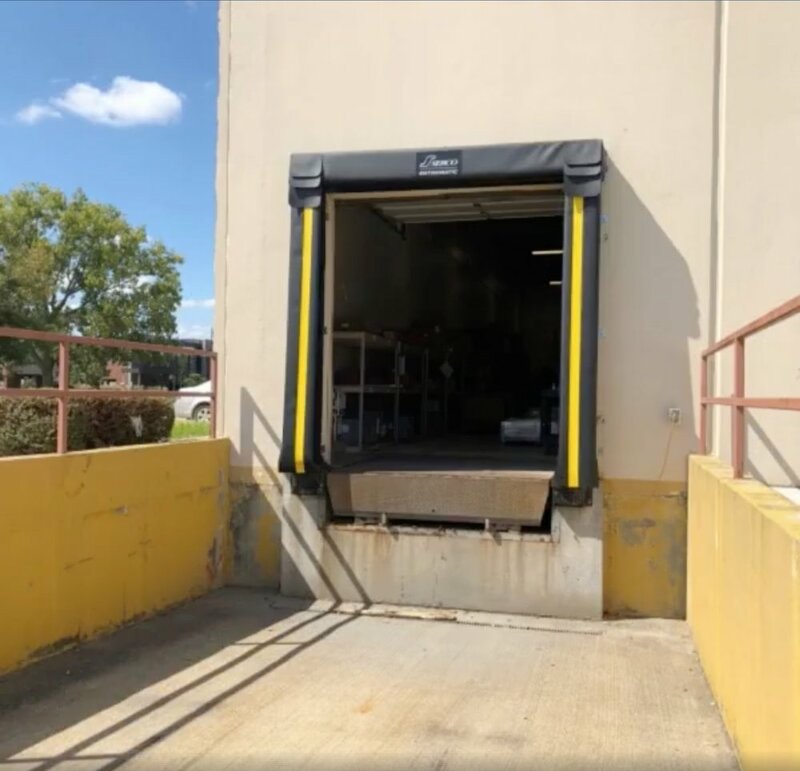 Loading docks have an increased potential for serious injury, the following are just a few hazards that present themselves on and around loading dock areas. Ensuring loading dock safety in your workplace can be a challenge. To maintain safety a checklist can be used to assure a safe loading dock area. Make sure all personnel are trained in dock safety and that rules are enforced. Ensure that wheel chocks are used on every vehicle at your dock. Protect pedestrians traveling through the facility by ensuring that operators of powered industrial trucks are trained to yield the right of way. Mark floors with yellow tape or paint to identify walkway barriers, doorways, parking aisles and overhead obstacles. Protect people traveling through your facility from sharp corners. Place padding or guards around sharp corners. Put an inspection program in place to review palletized materials. If pallets are defective, the product should be moved to a safe pallet. Review warehouse ergonomics. Adjust the height of conveyors to eliminate lower back stress. Place heavier products at knee to chest high levels. Limit the amount of weight a worker must carry and allow for assisted lifting from other workers. Install guards on conveyor sprockets, gears and rollers. All pinch points must be protected and labeled. Use plastic or metal banding to secure product to pallets for transportation or storage. Shrink-wrap loose product for transport or storage. It is very important to secure small items that might fall through the overhead guard of a lift truck. Clean out dock areas periodically to remove accumulated debris. Only allow OSHA documented, trained, authorized employees to operate powered hand trucks, hand jacks or forklifts. Inspect the dock area daily to ensure that emergency equipment is not blocked or damaged. Paint the dock edge a reflective yellow to provide a better view of the dock. Verify that ladders from the dock floor to the dock will meet OSHA specifications. Ensure that proper illumination for exit doors, docks, handrails, and steps comply with OSHA 1910.24. Identify and mark overhead hazards such as pipes, doors and electric wires. Prohibit dock jumping, which can lead to serious ankle, knee and back injuries. Make sure that dock plates and boards are designed for the loads and lift trucks used. Always inspect the floors of trailers and trucks before a forklift or pallet jack is driven onto them. Always inspect the landing gear and place jack stands under trailers that are spotted at your dock. Always make sure dock levelers are returned to the stored position after being used below dock. This will eliminate a "void in the floor" and help prevent forklift cross traffic accidents. Provide a dock seal or dock shelter to keep rain and snow off loading docks which can cause slippery surfaces. Training is the primary means of keeping your employees safe in a loading dock environment. There are many mechanical devices that if used and installed properly, can help reduce potential hazards in these areas. Wheel chocks are an essential safety device used for securing the wheels of tractor trailers delivering or picking up material. Wheel chocks secure the wheels of the trailer so that trailer creep and/or movement of the trailer are eliminated. Chocks are made of rubber, steel, aluminum or other different materials. These steel or aluminum ramps are used to bridge the gap between the truck trailer and the loading dock so that pallet jacks or forklifts may move product in and out of the trailer. Employees should be trained on the proper and safe use of dock boards. Poorly placed dock boards may cause the forklift and or loads to overturn. Dock boards are generally portable but typically require the use of a forklift to move them. They are used in more industrial and heavier load environments. Dock plates are a smaller and more portable equivalent of the dock board. They may be constructed out of aluminum, steel or polyethylene and do not have the weight capacity of the dock board. If you only use hand trucks or pallet trucks you may need a dock plate not a dock board. Dock levelers are items that also bridge the gap between loading docks and trailers; however, the dock leveler also helps correct the height difference between loading docks and trailers. Dock levelers are permanent devices that are operated either by hand (mechanical), or by hydraulics. A new technology that has begun to emerge is the use of signaling devises that indicate that a person or powered industrial truck is in the trailer or that the trailer is properly secured and forklift traffic can enter the trailer. Guarding devices are essential to loading dock safety. Examples of guarding devices are guard rails, bollards, and stops. A safe loading dock will find guardrails being used to separate pedestrian traffic from the production traffic of the loading dock. In addition, guard rails can be used to protect stationary equipment or machinery and structures from accidental impacts from forklifts. Bollards serve much the same purpose but are used to protect building corners or where space around an area is limited. When placed correctly the bollard will keep a forklift from damaging a structure more severely. Another guarding item commonly found are stops. Stops are steel plates placed along raised locations in a warehouse or loading dock intended to keep personnel and forklifts from falling over the edge of a raised area. Q. Is there a specific OSHA standard for loading dock safety? A. Yes, OSHA 29 CFR 1910.176 material handling and storage. In addition, you will need to use a combination of standards to ensure that you have a safe loading dock area. Some of these standards are: 29 CFR 1910.178 general industry, 29 CFR 1926.600; 1926.602 construction, American National Standard for Powered Industrial Trucks, Part II, ANSI B56.1-1969, OSHA 29 CFR 1910.22 walking-working surfaces, and the ANSI A1264.2-2006 provision for the slip resistance on walking/working surfaces. Q. What are the primary differences between a dock board and dock plate? A. A dock board will be constructed of steel or aluminum, will have side curbs, lifting chains or loops, locking pins or legs, and will have weight capacities of 10,000 lb, 15,000 lb, and 20,000 lb. The dock plate can have many of the same features but will have considerable lower weight capacities and may be able to be moved by hand. Most dock plates do not have safety curbs or locking pins and are recommended only for non-powered loading and off loading of material. Q. What are other dock safety items that may be considered? Source: Grainger "Loading Dock Safety"